President Maithripala Sirisena yesterday effected a mini yet decisive reshuffle of the Cabinet of Ministers, reinforcing his authority in the Coalition Government despite reservations from UNP leader and Premier Ranil Wickremesinghe. Contrary to expectations of a wide-scale change, what the country saw yesterday was a revision of the status quo of nine Ministers, most notably the swap of portfolios between the Ministers of Finance and Foreign Affairs. The controversial yet hands-on Ravi Karunanayake was removed from his Finance portfolio and given the Foreign Minister title while his predecessor Mangala Samaraweera, widely perceived as being “Mr. Clean” and “apolitical”, was handed the mantle of managing the country’s finances along with the media. Furthermore, 1996 World Cup-winning Captain Cool Arjuna Rantunga was stripped off his Ports and Shipping Minister portfolio and put in charge of Petroleum with the amiable Mahinda Samarasinghe taking over the Ports and Shipping Ministry. These were the major surprises apart from Fisheries Minister Mahinda Amaraweera being given additional duties as State Minister of Mahaweli Development. He is also the General Secretary of the UPFA. In other changes, S.B. Dissanayake was appointed Minister of Social Empowerment, Welfare and Kandyan Heritage, W.D.J. Seneviratne was made Minister of Labour, Trade Union Relations and Sabaragamuwa Development, Gayantha Karunathilake became Minister of Land and Parliamentary Reforms and Chandima Weerakkody was named Minister of Skills Development and Vocational Training. Deputy Ministers to the relevant new Ministers will be announced after President Sirisena returns from a three-day state visit to Australia beginning today. The move to bring back Thilak Marapana, who was forced to resign from his portfolio as the Law and Order Minister last year amidst dubious circumstances, drew much criticism as an action which went against the good governance principles of the current Government. However, civil society groups have strongly criticised the move to bring Marapana back. “There was a demand by civil society groups for the Government to respond to the Avant Garde case and remove the ministers who defended company blocked action being taken against it. But instead the President has brought the Minister back to the Cabinet,” Campaign For Free and Fair Elections Executive Director Keerthi Tennakoon told Daily FT.
Tennakoon was also critical of the decision to remove Mangala Samaraweera from the Foreign Ministry. “Despite our opinion of his local politics, Mangala Samaraweera as the Foreign Minister did a good job in handling the international community and handling the ministry efficiently. Now he has been given a ministry without any powers,” Tennakoon added. However, other groups welcomed the move to remove Karunanayake from the Finance Ministry, claiming that the former Finance Minister worked against the interests of consumers. National Movement for Consumer Rights Association President Ranjith Withanage welcomed the new appointment to the Ministry of Finance, claiming he was confident of Samaraweera’s capability to work efficiently. Marapana, who was appointed as a MP from the UNP National List after the August 2015 general elections, resigned in November 2015 following the controversial remarks he made during a parliamentary debate on the Avant Garde company for which he served as a legal counsel. Marapana has had a chequered history as a Minister. He was appointed Minister of Defence when the UNP took power in 2001 but was among the three Ministers sacked by then President Chandrika Kumaratunga in November 2003, a move which eventually led to the fall of the UNP Government the following year. Prior to yesterday’s meeting the President and the Prime Minister held a discussion on Sunday regarding the Cabinet reshuffle. According to party sources, UNP Ministers had agreed to the reshuffle provided the party would retain the same portfolios and the same number of ministerial positions. AFP said Monday’s reshuffle had been foreshadowed for months and was opposed by the UNP, which feared losing powerful posts within the coalition. Wickremesinghe attended Monday’s swearing-in ceremony for new ministers, which was off limits to the press. 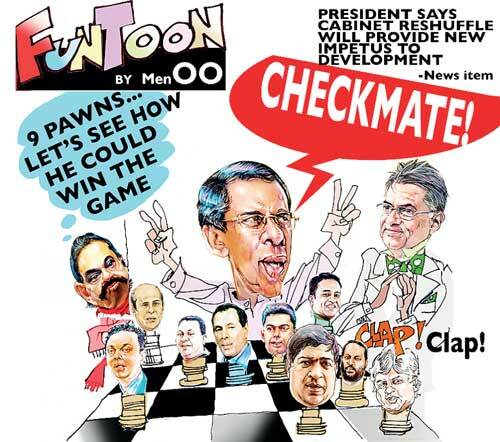 There was no immediate comment from the UNP regarding the shake-up. Sirisena also removed Ports Minister Arjuna Ranatunga, who had been resisting Government efforts to forge a partnership with China to develop a loss-making, deep-sea port in the island’s south. The reshuffle comes as Sirisena faces mounting criticism from the international community over the slow pace of promised reforms and delays in addressing Sri Lanka’s wartime past through a mediated reconciliation process.